Wolf, Rebekka. Kochbuch für israelitische Frauen, enthaltend die verschiedensten Koch- und Backarten, mit einer vollständigen Speisekarte und einer Hausapotheke, so wie einer genauen Anweisung zur Einrichtung und Führung einer religiös-jüdischen Haushaltung. 4. sehr verm. Aufl. ed. Berlin: Adolf, 1865. Wolf, Rebekka. 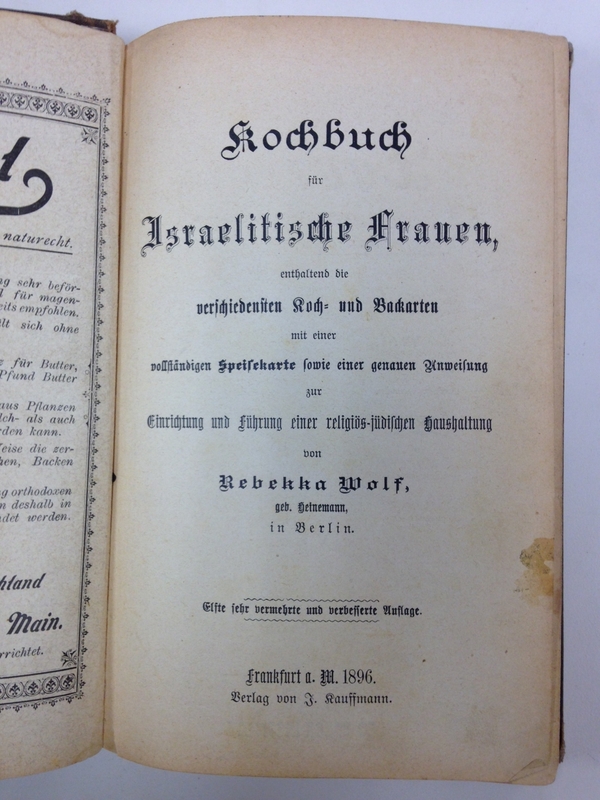 Kochbuch für israelitische Frauen : 11th Revised Edition. Frankfurt. 1896. Based on the number of times new editions of her cookbook were published, one could make the assumption that Rebekka Heinemann Wolf’s cookbook may have been more popular than even Bertha Gumprich’s seminal cookbook. 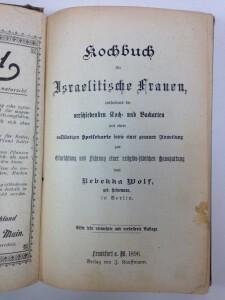 The first edition of Kochbuch für israelitische Frauen (Cookbook for Jewish Women) was published in 1851 in Berlin. Currently, Worldcat.org lists only one copy of the first edition worldwide at Indiana University Bloomington. Since its first publication in 1851, Wolf’s cookbook was continuously revised and expanded through 14 editions, the latest known edition published in 1933 in Frankfurt. There were even Dutch (Kookboek voor Israëlitische huisgezinnen. Almelo : Blenken, 1881) and Polish editions (Polska kuchnia koszerna. Warszawa : nakł. tłumacza, 1877). Despite the author’s apparent popularity, there is little easily obtainable biographical information about Wolf other than what can be surmised from her cookbooks. 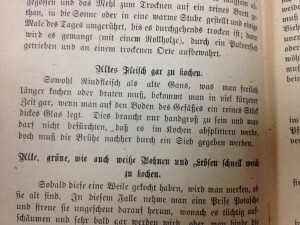 Based on the first edition’s subtitle, which states that her cookbook contains “recipes from different cooking and baking styles from regions where the author lived in for many years,” one could guess that she may have been employed in household kitchens in many different regions of Germany, possibly even in regions outside of Germany. In the fourth edition, published in 1865, she mentions states her age as 64 years old (p. 229), which would make her year of birth 1801. This page shows the prayers the woman recites when lighting the Sabbath candles. 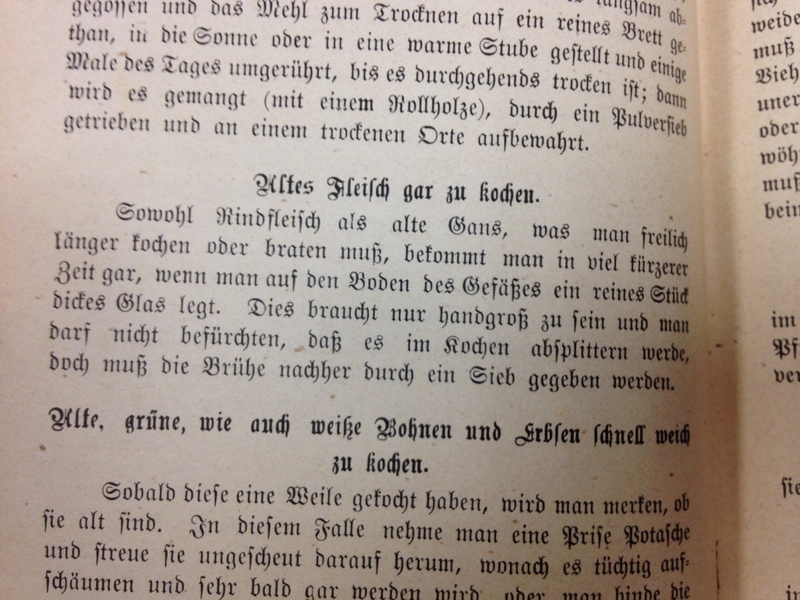 Although Wolf’s cookbook offered housewives the opportunity to surprise guests and family with “einem fremdartigen Gerichte” (an exotic dish), what was really special about the Kochbuch für Israelitische Frauen may have been its emphasis on Jewish customs. 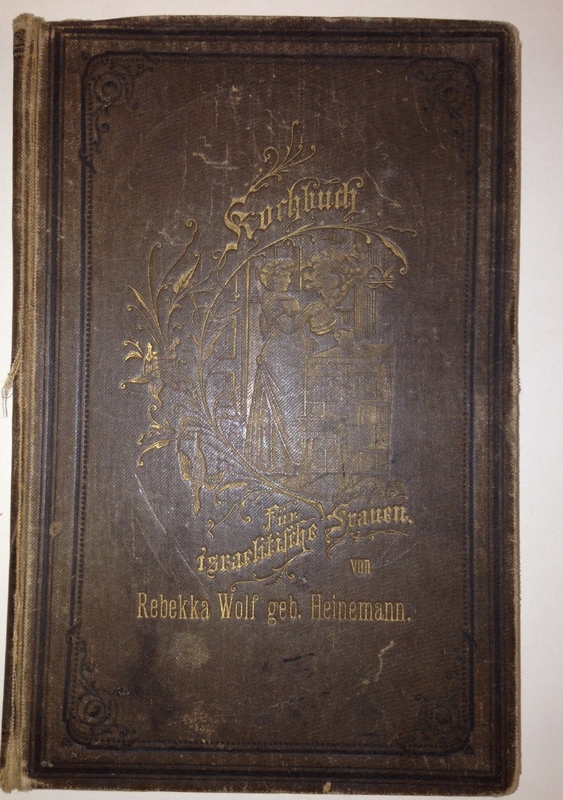 Worldcat.org lists only one other Jewish cookbook published before 1850, but Wolf’s is the earliest listed cookbook published in German. Although other practical cookbooks existed, Wolf may have filled a gap for Jewish households. All of her dishes were written with Jewish religious practices in mind. In the forward to the first edition, she wrote that she intended her cookbook for Jewish women who want to prepare plain meals with economy, but also be able to cook fancier dishes for guests and holidays. In particular, she wrote that many newly married Jewish daughters hadn’t learned the traditional religious practices before they left their parents’ home, which created a dilemma if a young woman’s husband was religious. Wolf’s book was not only practical—the author stressed that she excluded all frivolous instructions, like directions on washing silks—it also introduced women to the role of traditional religious practices in the Jewish kitchen. Her cookbook had directions for how to prepare kosher meat and set up a kosher kitchen. 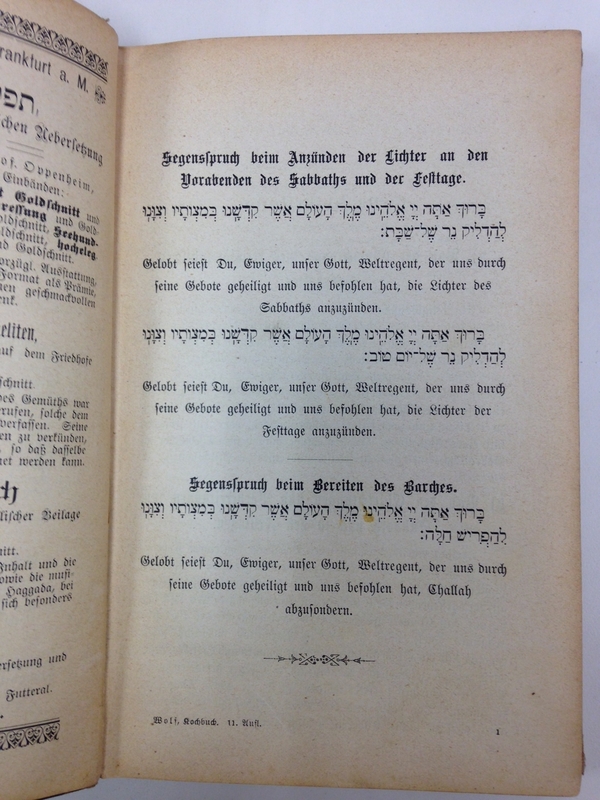 She even included the blessing women needed to say while lighting candles on the Sabbath, written in both Hebrew and German. One takes slaked lime, thins it out with water, places eggs that were laid in August or September in a stone pot and slowly pours the slaked lime water on top of it. The water should cover over the top of the eggs. The eggs will stay fresh throughout winter in this way. Don’t put any preserves near the pot or they will rot. Rebekka Wolff included in her cookbook tips for housewives, such as how to cook old meat. See description in text above. For beef as well as old goose, which one admittedly has to cook or roast a little longer, one can cook it thoroughly in a much shorter time, if one lays on the bottom of the container a clean piece of glass. The glass only needs to be as big as a hand and one does not need to fear that the glass with splinter during the cooking, but the broth will definitely need to be run through a sieve. Each lemon is wrapped in white paper and layered with dried salts in a stone pot. The stone pot has to be covered so that it is airtight and must also be a little covered. Some of Wolf’s advice is certainly out-of-date in the 21st century, but many of her recipes, like strudel with cheese or poppy seed fillings, or stuffed duck breast, are timelessly delicious. 11th much enlarged and revised edition. Frankfurt a. M. : J. Kauffmann, 1896. — Library call number st 3566. 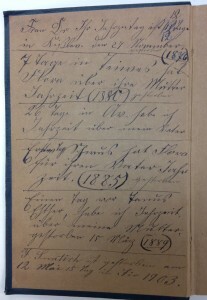 In the cover of one of the editions of the Wolf cookbook, the owner made various notes documenting their family history. 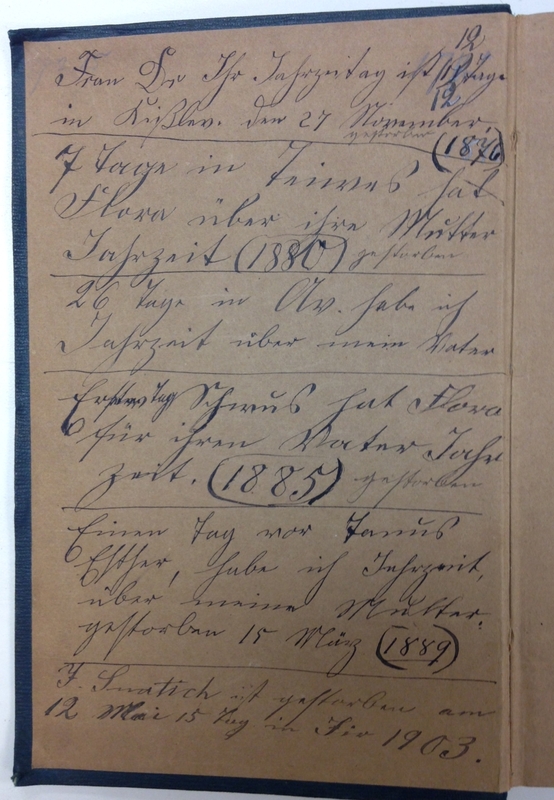 Thus, the cookbook becomes an important genealogical record. 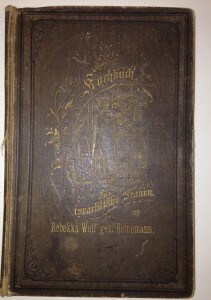 The cover of the 11th edition of the “Kochbuch” by Rebekka Wolf.